I commissioned my first piece of art. I needed a splash of color for my office wall so I asked my friend Nisha Shankar, a talented artist hailing from Vancouver Canada if she could do a piece for me that captures my love of travel and the mountains. The process took a few weeks. After meeting to chat about what I was looking for, we communicated via text message, Nisha sharing her work-in-progress and soliciting my feedback. She wanted me to be happy with the piece. I expressed what was working for me and what wasn’t, but tried to stay away from art directing. I wanted it to be 100% Nisha. In the end, we were both delighted with the result. I love her depiction of the world as a place of colorful beauty where borders bleed together. The compass rose, and the mountain range incites a sense of exploration and adventure. ​When I picked up the piece, Nisha told me that she names her paintings. She called this one “The Explorer” and she wrote this poem to accompany it. You have conquered the world. Last Sunday, I spoke at Central Avenue Church in Glendale, CA. It was the first sermon I’ve given since I moved to Los Angeles in 2005. In the early 2000s, I regularly spoke when I was on part-time staff at churches in New Hampshire and Connecticut. A lot has changed since then. I’m older. I've grown from life experiences. And I’ve had a lot of time to think about what I would say. Here it is. 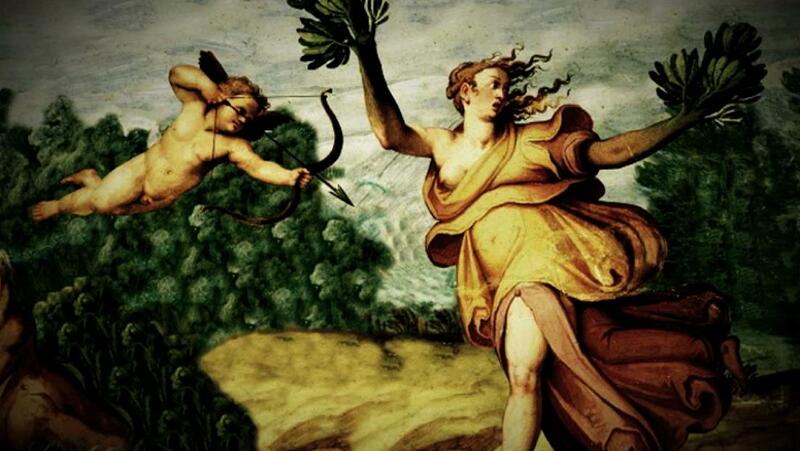 I spoke on the Parable of the Wedding Feast. You can listen to it below. A hand-drawn map given to us the night before our trek began. What to say? I’ve been pondering what to write about the mountain since I returned. We’ll start with the facts. It was a 49-mile trek up and over the world tallest freestanding mountain. We took the Rongai route to the summit, a drier but less popular route because of its starting location on the north side, the Kenyan side, of the mountain. It took four days to reach the summit. We trekked through diverse climate zones including rain forest, moorland, alpine desert, and artic. It was cold at the top, especially at night, wind chill around 0 degrees. There were 21 people in our group. 17 reached the crater rim. We descended the mountain on the Marangu route, a popular route on the southeast side of the mountain. A crew of 75 guides and porters assisted us at varies times along the way. Those are the facts, but the experience is something I’ll be thinking about for the rest of my life. Mornings on the mountain began with a guide knocking on our tent and a choice of tea or coffee - a hot drink to enjoy in our tent while our bodies woke to a new day. The guide would return later with “washy washy,” a bowl of warm water for which we could try to maintain some semblance of hygiene. Around 7am a breakfast consisting of porridge, bread and jam, eggs, and fruit was served in the mess tent. After breakfast, we packed and set-off for the day's journey. I carried a daypack with three litters of water, extra clothing layers, snacks, and essentials, like sunscreen. My duffle bag, which contained the rest of my gear, was carried by a porter… on her head. The stamina the porters demonstrated was remarkable. They did everything we did (except for the summit) only much faster and with a heavier load. When we reached camp in the afternoon, our tents were set-up and ready for us, and a snack of popcorn and hot tea awaited in the mess tent. The operation was seamless. It made the time on the mountain not only bearable but also enjoyable. Mountain living, it turns out, wasn’t so bad (except for the not showering for days and having to use a toilet tent). For the first couple days, the pace was excruciatingly slow. “Pole pole” (pronounced poll-e, poll-e) the guides would implore us. “Slowly Slowly” It is how you acclimatize to the mountain. It is how you reach the top. By day four, they wouldn’t have to remind us to "pole pole." The most challenging days of the trek were days 4 and 5, which felt like one long day. On day four we walked 5 hours across the barren wilderness called “the saddle.” It was a moonlike landscape of dirt and rocks and few hardy floras. The views were sweeping, the distances deceptive. The winds howled, piercing our wool and nylon layered defenses. It was a taste of what was to come, but we didn’t know it yet. We arrived at Kibo Hut, base camp, early in the afternoon. We ate lunch and then were sent to our tents to rest for the afternoon. We would make our push to the summit that night. At dinner, we learned that one of our fellow trekkers would leave the mountain immediately because of altitude sickness. Struggling the last couple days with nausea, headaches, and fatigue his condition was not improving. He had become incoherent, and a blood/oxygen reading had indicated that it was serious. They gave him emergency oxygen, put him on a stretcher, and three guides rushed him to a camp at a lower altitude. There, a vehicle would take him to a hospital where he could be monitored by doctors. Fortunately, he would be fine. Once off the mountain and at a lower altitude he returned to his usual self. That’s the thing about altitude sickness; you never know how it’s going to affect you. Age and fitness level have little to do with it. I was fortunate. I experienced only minor effects from the altitude. After dinner, we returned to our tents to rest. I was restless, wondering camp, snapping pictures, looking up at the snow-covered carter. I spoke to one of the guides who implored me, “My friend. Please try to get some rest.” I heeded his advice and returned to my tent and tried to get some sleep. At 11pm the guide knocked on our tent. It was time to go. We met in the mess tent, where they tried to feed us again, but nobody had much of an appetite. At midnight we lined up, headlamps blazing, and began our slow march up the crater wall. I’ve been asked why we started the final ascent in the middle of the night. I’m not entirely sure, but I think it is a combination of factors. The weather is more predictable. It provides the opportunity to see the sunrise from the peak. It saves time, only needing to spend one night at high altitude base camp instead of two. But I think a primary reason is that in the dark, you can only see what’s right in front you. It forces you to stay in the moment, one foot in front of the other. I wore five layers over my torso: a long-sleeve polyester base layer, a wool sweater, a synthetic down jacket, a zip-up fleece, and the water-resistant windbreaker. On the bottom, I wore a pair of leggings and thick hiking pants. Covering my head was a wool skullcap and a thicker stocking cap. I was cold. Very cold. Though I was wearing gloves, I had to limit the use of my trekking poles because they exposed my hands to the elements. When we were moving, the cold was uncomfortable but tolerable. When we stopped for a short rest, my body started shaking. At one point, I asked a fellow trekker if we could cuddle for a few minutes and share our body heat. This was the challenge of Kili, different from any other endurance challenge I’ve faced. It was not the fitness required that made it difficult. It was the fatigue and the cold, intensified by labored breathing in the thin air that tested my mental fortitude. There was a moment about halfway up the seeming never-ending switchbacks that I thought to myself, “Man was not made to be on mountains like this.” Yet there I was. I could hear the sound of my fellow trekkers pausing to vomit. Feeling better, they got back in line and continued on their way. Our guides were wise. At just the right moments they would sing, all of them, in harmony. They sang in English and Swahili, old hymns and spirituals and the occasional pop song. Their voices lifted our spirits. At times, it was a transcendent; my body trembling in the wind-blown cold, my mind wavering between determination and doubt, the infinite depths of glittering night sky blanketing us from horizon to horizon, our guides singing to us Leaning on the Everlasting Arms. I’m near the lead guide when calls out, “Do not give up. I can see the top!” I knew we had to be getting close. The horizon was glowing. The sun was about to make its appearance. After five-and-a-half hours, the long journey into night was almost over. There was a release of emotion when we stepped onto the crater rim at Gillman’s Point. Each person arrived to hugs and tears. Our guides poured cups of hot tea to revive us. The joy of reaching this point, of no longer climbing in the darkness, was euphoric. The sun broke the horizon, and I got my first peek into the snow-covered crater. I will be a sight I never forget. The thrill of the moment was short-lived. The realization dawned that we were not finished. We had summited the crater rim, but Uhuru Peak, the highest point on Kili, at 19,340 feet, was on the opposite side of the crater rim. We still had a ways to go. We waited for our turn to take pictures. I put a smile on my face. Our group crowded together to document the moment. Once the cameras were down, we turned to our guides and told them to get us off this mountain. The descent was fast. It took about three hours. Most of the time made up by avoiding the switchbacks and sliding down the long scree slopes. It was skiing with our feet, a tiring exercise for the legs, but much faster. And we were down for faster. I arrived back at my tent mid-morning. The summit trek had been a 10-hour ordeal. Out of the wind into the warmth of my sleeping bag, my body rested, and my mind tried to process what just happened. The next day, we experienced the ritual tipping ceremony. Our guides and porters sang songs, and in the form of tips we thanked them for sharing their mountain with us and expressed our gratitude for their kindness and help. The tips were divided among the crew allocated to individuals based on their responsibilities. We ended our trek with a 12-mile descent through beautiful moorland and rainforest. I couldn’t wipe the silly smile off my face when I turned the corner and saw the gate exiting the park. It was over. Our time on the mountain had come to an end. We bought cold beers at the gift shop and toasted to our time on the mountain. A lager never tasted so good. It has been nearly a month since I was on Kili. I’ve thought about it every day. I’m reminded of something Jesus said about faith that can move mountains. In my experience, the only thing moving mountains is the massive tectonic plates beneath the earth’s crust. Perhaps he meant that with faith you can move through mountains. You can transcend the immovable obstacle, ascend to its sun-kissed summit, and feel the Spirit alive in you once again. That is the power of the mountain. That was Kili for me. In just a few weeks, if all goes according to plan, I will be breaking camp slightly after midnight, in below freezing temperatures and dizzying thin air, to begin the final push to Uhuru Peak, the highest point on Mount Kilimanjaro. I’ve been anticipating this moment for months. I’ve spent more time at REI than Target purchasing supplies and clothing. I paid a visit to the travel doctor to get my shots and malaria medicines. I’ve gone through my packing list a ridiculous number of times to be sure I’m not missing anything. I'm ready. This past Sunday I trecked the 10.5-mile round-trip hike up Mt. Baldy, a popular 10,000+ foot peak in Southern California. This was an opportunity to test new gear, spend a little time at altitude, and think about what the perfect playlist might be for the trip. (I’m leaning towards sticking with classical music. Something without words, something that conjures the feeling of scale and awe.) 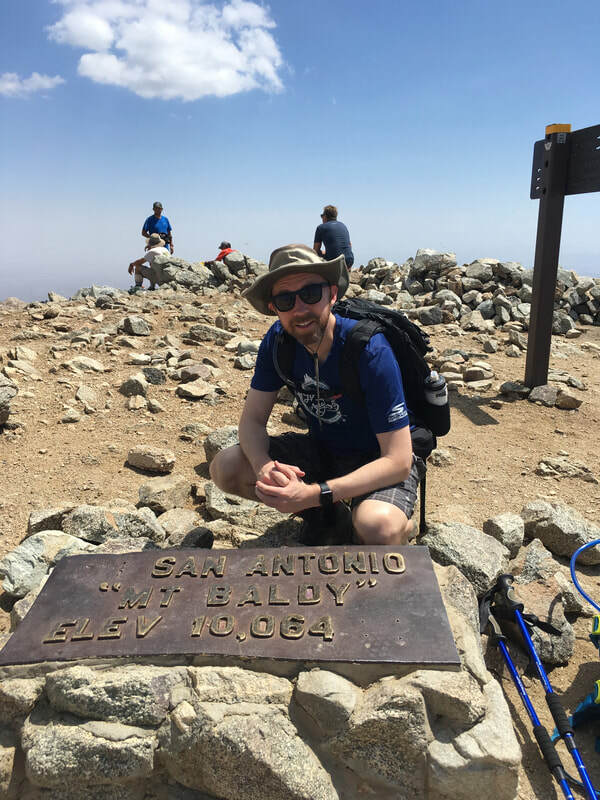 The hike was great, even the section of the trail called the “Devil’s Backbone” - because of the narrow path with steep drop-offs – rewarded with the sweeping views of the desert in the distance. “He lived out in California, right? Worked in entertainment? As you can see, I’ve had too much time to think about these scenarios. Fortunately, I won’t have to wait much longer. I’m still raising funds for safe drinking water, sanitization, and hygiene education. When I arrive in Tanzania, I will be visiting areas that will be supported by the donated funds. It is easy to give at my fundraising site: http://causetrek.compassion.com/nathandavis I will provide a full report on the safe water projects our donations are supporting when I return. My next post will likely be after the trip. Stay tuned for pictures, descriptions, and accounts of the journey. Here is proof that I made it to the top of Mt. Baldy. It is fitting that this week Weezer released a cover of the classic Toto song “Africa.” (listen here) I’ve been listening to it on repeat; not only is it a great song, but it is an excellent soundtrack as I prepare for my journey to Africa. 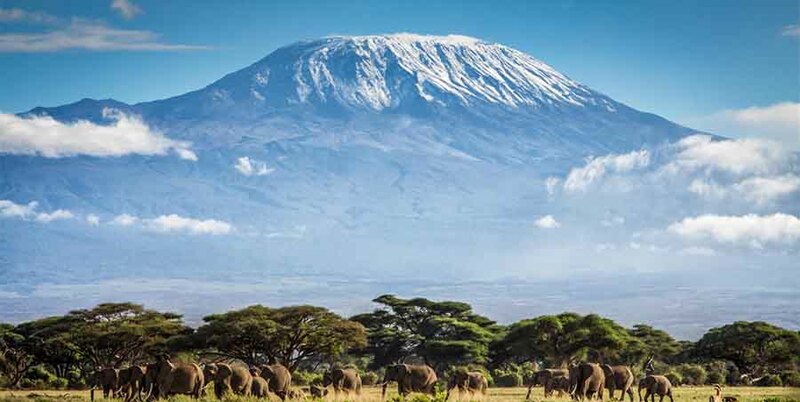 In two months, I’ll be traveling to Tanzania to trek to Uhuru Peak, the roof of Africa, on Mount Kilimanjaro. This is something I’ve wanted to do since I saw the IMAX film about the mountain 16 years ago. There is an allure to it; the largest free-standing mountain in the world, a snow-capped peak on the equator, an ancient volcano formed a million years ago. Now, it is finally beginning to feel like the journey is close at hand. I’ve been accumulating my gear piece-by-piece and keeping my fitness level up by running and hiking the local mountains. The trek will cover 44 miles, but it is not the distance of the journey that will be the biggest challenge. The thin air at 19,340 feet is the wildcard factor that I cannot prepare for. There is no way to know exactly how my body will respond to the altitude, but that is part of the adventure, the unknowing and the perseverance required to overcome the challenges. The promise of a trip of a lifetime is not the only reason I’m embarking on this journey. I am doing this trek to raise funds to provide clean drinking water, safe sanitation, and hygiene education for people in Tanzania and in other developing countries. I’m committed, with my fellow trekkers, to raise at least $1,500 for Compassion International’s WaSH (Water, Sanitation, Hygiene) fund. But $1,500 is the minimum. I want to raise at least $2,000. For so many families in developing countries, the family facet is not a spigot in the kitchen but a long walk to a stream or well. The U.N. estimates that in developing countries, women and girls — who do 90 percent of all water and food gathering — walk an average of 3.7 miles daily to collect water and even then the water is not always safe for drinking. The issue is not just the provision of safe drinking water. Adequate sanitation and hygiene are vital to preventing the spread of disease. When children are sick, they miss school. When parents are sick, they lose work. Access to safe water and sanitation is one of our key weapons in the battle to release communities and families from poverty. Would you please consider making a donation to this cause? It is simple and tax deductible. Head over this my fundraising site http://causetrek.compassion.com/nathandavis and click the "Donate Now" button. I am covering all costs for the trip. 100% of your donation will be used to help provide clean drinking water, healthy sanitation, and hygiene education. I arrive at the Regal LA Live Theater in the heart of downtown LA. It is Thursday, April 26, Opening Night for Marvel Studios’ Avengers: Infinity War. I’ve been counting down the days to this night for past two months. Everything about the marketing campaign for this film has been immense and this campaign, more than any other, has kept me awake at night. I’m standing in front of an art installation breathing a sigh of relief. I have been working with James Raiz, an illustrator from Toronto, on this Marvel Studios 10th Anniversary celebration piece. 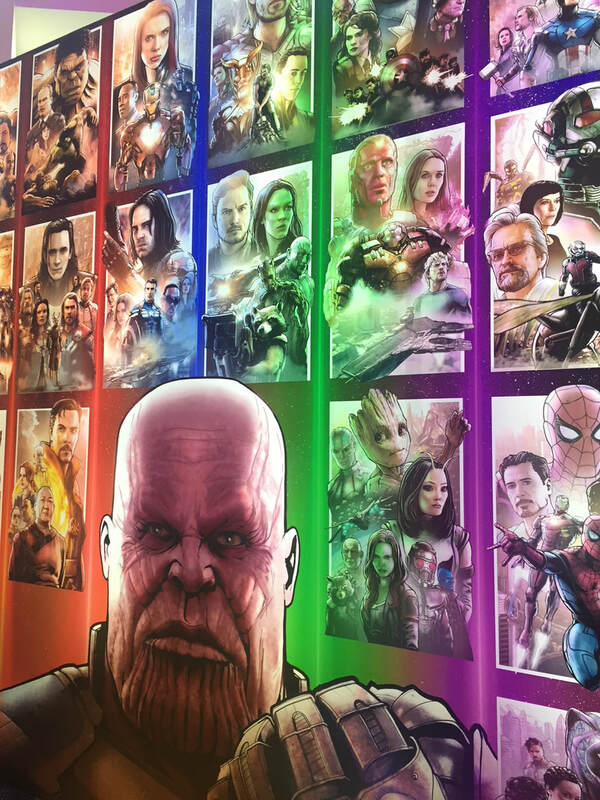 He spent 250 hours hand-drawing 18 character panels, representing each of the 18 films in the Marvel Cinematic Universe. 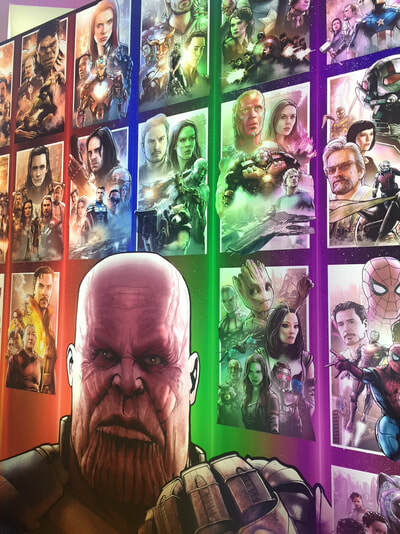 The centerpiece is a giant Thanos – the villain in Infinity War. Ten years of movies have all been leading up to this. The piece is impressive. Fans are engaging and taking pictures. The artist texts me. He is on his way to the theater. I see the team from Moviebill arrive. I’ve also been working with them to launch the debut issue of their publication. It’s like a Playbill, but for movies and with a 3D augmented reality overlay. It features interviews with talent, behind-the-scenes editorial, and exclusive art. 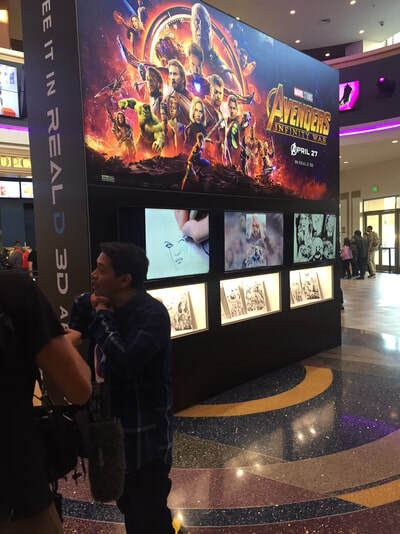 The Avengers: Infinity War Moviebill will be handed out to one million people at Regal cinemas opening weekend. The excitement of launching a new product is evident on their faces. It’s a big day for them, and I’m curious to see how fans respond to the product. But I’m not at the theater for either for the artist or Moviebill. I’m here for the fan event – a premium ticket early screening of the film that includes a collectible coin, exclusive bonus content, and popcorn. My team planned these events at nearly 600 locations across the country. This morning, I received word from the studio PR team that Joe Russo, one of the directors of the film, would be coming to the LA Live theater to make a surprise visit. My phone rings. It is Joe’s driver. He’s here. I meet Joe outside, and I bring him into the theater. We make a stop to get popcorn. He is relaxed and easygoing. I lead him to the holding room where we wait until it’s time for the introduction. Joe is glancing at his phone to see who his Cleveland Browns take in the first round of the NFL draft. We make small talk. We talk about the shocking ending. If there was any concern about the movie, it was how fans would react. The film opened the previous night in European markets. So far, the response has been positive. Joe tells me that he has some time before he has to be at USC for a lecture, maybe he’ll stick around for a while and watch the movie with the fans. I tell him no problem. I text my co-workers and tell them we need a seat for Joe. It’s a sold-out show. Fortunately, they find a fan sitting near the exit that is more than happy to give up his seat for the director and a fifty-dollar gift card. The trailer package ends, and we enter the side of the darkened theater. The anticipation is palpable like the eagerness of a child waking on Christmas morning. I take the microphone and step to the front of the theater. I introduce myself and welcome them to the Fan Event. I tell them that there is someone here that wants to say something. They gasp. Immediately and in complete synchrony, I see 200 faces disappear as 200 camera phones are lifted to record whatever happens next. I introduce Joe, and the fans erupt. Joe is a pro. He thanks the fans for being so great and talks about the year-and-a-half journey leading up to this night. He takes his seat. The movie begins. The excitement hits a fever pitch. I stand off to the side and watch the first 10 minutes. The fans’ reaction was mix of laughter and cheers. So far so good. I leave to find James, the artist, who has just arrived at the theater. I find James in front of the art installation interviewing for his YouTube channel. His wife, kids, and parents watch from a distance. The previous day, James and I connected over lunched. He told me his story. His parents emigrated from the Philippines to Canada before he was born. His parents hoped he would become a doctor. When he was in high school, he told them he wanted to go to art school. The news did not go over well. In his parents' mind, an artist was a person on the street who draws pictures for change. That is not why they moved to Canada, so their son could beg for money on the street. He brought his parents to Los Angeles tonight to show them how far his art has taken them. He wants them to see, to understand, that he can be successful with his art. I speak to his parents, beautiful people who sacrificed much so that their children and their children’s children might have a better opportunity to prosper. I point to the art piece and say, “Look what your son has done. I hope you’re proud of him!” “We are proud of him.” They respond with a gracious smile. Here are a couple pictures of the art installation. I snapped these pics with my phone, Not great pictures, but you get the idea. That's James giving an interview in front of time-lapse videos of him drawing the pieces. My phone buzzes with a text. Joe is heading out of the theater. I reunite with him to thank him for coming. He doesn’t know it yet, but he is the director of the movie that will have the biggest box office opening of all time, but right now he is hungry, and he is going to grab a bite to eat before his next engagement. I’m hungry too. A few of us decide to grab a drink and satisfy our appetites. One fan cannot contain himself. He jumps out of his seat and runs to the side exit hall where my co-worker and I are standing. “Oh, my God.” He cups the temples of his head with his hands. “That was so epic!” He recognizes us from the beginning of the show and introduces himself. “My name is Cameron.” He can’t stand still. He is checking his phone, rubbing his head, swaying back and forth. He is processing. I drive home that night, and I am relieved. Avengers: Infinity War is finally out in the world. All the long days at work have paid off. I think about the movie. It’s just a movie, a fantasy/adventure with a bunch of costumed superheroes. I think about the reaction it solicits, the way it affects people, and I understand that for many it’s not just a movie. We live in a time of deep polarization. Maybe a movie like this, which brings people from all countries, languages, and worldviews to a theater to sit next to each other and watch our heroes try to be the best versions of themselves they can be – because the fate of the world depends on it - is just what we need. Last May I met up with my friend, Jeremiah, in Kanas City to hang out and work on a new idea I had for a screenplay. I came back with a rough outline for A EULOGY FOR THE BELIEVER and about 25 written pages. Not bad. I spent the rest of the summer trying to finish the script. I got to 100 pages before I shelved it without showing it to anyone. I didn’t even write an ending. I thought it was terrible: incoherent, rambling and unmotivated. I was frustrated. After that draft, I convinced myself that I had somehow become a worse writer. The only activity in my life I have found to be truly satisfying is writing screenplays. That’s a big statement because I’ve experienced no commercial success with my craft. But it’s true. When I’m working on a screenplay I’m passionate about it doesn’t matter what else is going on in my life. I’m okay. I find it creatively satisfying. Travel is the only other activity that comes to close this feeling of satisfaction. When I’m not writing stories, I feel lost. That’s when I start asking the big questions: What am I doing with my life? Is this is all there is? What does it all mean? Is it time to make a big move? Should I wander around Europe for the next year? Maybe I should go live in a village on an island in the South Pacific and see what that’s all about? I started on the novel in an attempt to divert such thinking. In February, I was procrastinating and commiserating to myself about how the book is going to take me years to write, so I decided to reopen that draft of A EULOGY FOR THE BELIEVER, just to see if it was as bad as I remembered it being. What I found surprised me. The draft was indeed rough and needed work, but there was a lot that I liked. It had life – the heartbeat of the story was there - and I discovered I could work with it. There is nothing more arduous than writing the first draft when every page is blank, and the task is to fill it with words. It’s exhausting. There is a first draft fog that descends. The writing is subpar because the goal is not craftsmanship but page count. It’s no wonder I finished the draft feeling defeated. Five months later, the fog had lifted, and I returned to the script to see it for what it is: a draft of a story that came from a personal place; a story that was worth fighting for. I put the novel on pause, and I spent the past month re-writing the script. I’m happy to say that I now have a readable draft that I’m proud of. I’m starting to share it with my writer friends for feedback. I plan to submit it to few festivals and contests next month. A year ago, February 25, 2017, to be exact, I wrote a post confessing that I hadn’t written anything new in almost three years. I can’t tell you how very satisfying it is to have a new fresh script in my pocket. My creative soul is no longer defined by past work. I still have something to say. And I hope it keeps the big questions away for a while. IO West, my improv theater, has closed its doors. I heard the ugly rumors, then received the e-mail confirming it to be true. My heart sank when I heard the news. The official statement credited the closing to ongoing disputes with the landlord. Little did I know that the development of the Hollywood & Vine district that revitalized the area would also force the little theater on the corner of Cosmo and Hollywood to go dark. Los Angeles will never be the same now that “my theater” is gone. I discovered IO West over a decade ago during my first year in Los Angeles when I wasn’t sure I was going to make it in this town. The theater introduced me to long-form improv, a new way of thinking about comedy and performance. Pursuing “truth in comedy,” a core teaching at the theater from day one, has forever shaped my approach to writing, my understanding of character development, and my philosophy on the creative life. I spent over a year at the training center. At the time, I couldn’t afford the classes, so I worked as an intern to pay my way. I took classes at night. I performed shows on the weekends. And on Friday nights I ran the lights in the “black box,” the small experimental theater behind the main stage. I watched countless hours of improv, some good, some not so good. I learned from it all. I met some of my closest friends there and performed with a group called “Camelot” for about a year before we went our separate ways. In recent years, I spent less time at the theater. My life moved on to a full-time job, writing, and the pursuit of personal goals, but there was always a comfort in knowing that IO West was there. Whenever I stepped into the place, the smell of the bar, the pictures of improv legends on the wall, the roaring laughter of the audience, the familiar faces, it all felt like home. The thing that made it special was that it was a place in the middle of Hollywood, known for cynicism and cut-throat competition, that still felt pure. There was no money to be made. No fame to be found. Teams performed at 11:30 pm on a Tuesday night because they loved what they were doing and loved the people they were doing it with. It didn’t matter if there was a packed house or three people in the audience who simply didn’t want to go home. When performers stepped on the stage, they knew that something unscripted was going to happen. It was often funny, and it was always revealing. I’ve learned a lot, and continue to learn, from studying and performing improv. But there was one lesson that stood out. I had an instructor tell us that you can't do improv with your weight back on your heels and your shoulders pressed against the wall. If you do that, you’ll never get to play. She said you have to lean forward with the full weight of your being over the balls of your feet ready to move, ready to step into the unexpected. Improv taught me to live life forward, in bold anticipation, ready to step into the unknown. ​Though the theater is dark, its lessons still light my way. This year I will face the fact that I’m 38 years old, and I am still single. Over the last decade and a half, I’ve watched as nearly all of my close friends have married and entered their child-rearing years. All the while, I keep saying “someday.” Some people assume that I must be gay or something. Honestly, this doesn’t bother me too much. If I were gay, I would say I’m gay, but I’m not gay. I’m just single. My singleness is not the result of a lack of trying. I’ve done my fair share of asking. Friends have set me up with people they know. I’ve spent too much time online, swiping left and right in what is a miserable human cattle-call numbers game called online dating. And yet here I am. The Rolling Stones were right: You can’t always get what you want. But being single has its advantages. In fact, there are many reasons why I’m grateful that I’ve been “#blessed” with an extended season of singleness. My taxes are easy. Without dependents, everything is more straightforward. In fact, I've already finished my 2017 taxes and collected my refund. This perk extends to other grown-up decisions like choosing insurance, a healthcare plan, or a doctor. Easy peasy. I can do stuff. I need not ask anyone for permission to go out with friends nor do I have to puzzle through logistics to make a night out happen. If I want to go out, I go out. If I don’t want to go out, I don’t go out. If I want to see a movie, I see the movie. If I want to go to a concert, I go to the concert. It’s that simple. I can travel. Travel is not impossible with others in your life, but it’s a lot easier if you’re rolling solo. The freedom to spontaneously travel is one of singleness’s greatest gifts, especially for someone who loves to travel as I do. No negotiations about where to go. If a place captures my imagination, I go there. I can take more risks. I doubt I would have been bold enough to move my life to California without a job and without knowing anyone who lived here if I had a family to provide for. My first few years in LA were tough. Being single allowed me to endure those challenging times and get to where I am today. I have time to do lots of fitness-y things. Being single has given me the time and resources to stay in relatively good shape and pursue fitness goals, whether that’s running marathons or racing triathlons. With no one waiting for me at home, I can take the extra time to hit the gym, take that yoga class, or go for a run. I get 8 hours of sleep every night. That’s right; I get eight hours of uninterrupted sleep almost every night. It’s how I’ve kept my youthful glow :) If I don’t get a full night of sleep, it’s by choice and usually because I’m doing something awesome. But here is the essential truth of my singleness “situation”: my life has no lack of love. Nothing is missing in my life, and there is no one out there who will “complete” me. Sorry Jerry McGuire, but that is a bunch of hogwash. I have felt the abundance of love in my life from family and friends, enough to last me lifetimes. I do not suffer from a lack of anything. 1 + 1 = 2 In this equation, two singles partner together, through mutual respect and selflessness, to make a something greater. Two is better than one. 1 – 1 = 0 In this equation, two singles take from one another. When this happens, both are left empty in the end. In the equation of love, I’d rather be a 1 than a 0. I have a pretty rad day job. I do in-theater marketing for the largest studio (by market share) in Hollywood, a studio that also happens to be on one of the most successful runs of films in the history of the movie business. Not a bad gig at all. There are a lot cool things about my job, but one of my favorite roles if finding and working with artist from around the world to commission custom art in support of a film. We do this because while we have the best creative print team in the business (my humble opinion), sometimes we’re limited on the amount of marketing art available, or we decide that want something that looks different from anything else we are doing in our campaign. That’s when we commission a piece of art. We call it “fan art” but the artists we use are professional, who also happen to be fans. My job is to find the artist, negotiate the terms, and give feedback on the piece from concept to completion. All creative must get approved by our marketing execs and by filmmakers, so I liaison between the studio and the artist until everyone is happy with the art and we can share it with the world. To find the artists, sometimes I work with curators of the fan art. I have a great relationship with Poster Posse (posterposse.com) who has introduced us to some great talent over the years. Sometimes we find an artist online and reach out directly to him or her. Here is a selection of some of my favorite pieces from the past couple years. I hope you enjoy them as much as I do.